Hi, I am interested in your 2018 Coachmen Brookstone (stock #R80074) listed on Autotrader for $53,500. I'd like to get more information about this vehicle and confirm its availability. 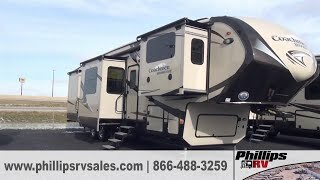 This Brookstone fifth wheel by Coachmen RV offers SIX slides, a front living room, dual entry doors, plus a convenient kitchen island, and so much more!Enter model 369FL closest to the front and find yourself in a spacious kitchen which features dual slides. There isa slide out dining table with four chairs to your left, and a second slide opposite that features a pantry with drawers, a three burner range including overhead microwave oven, and a refrigerator. There is a second storage pantry along the rear most interior wall, and a hutch with storage above and below along the front interior wall.Head up the steps to a front living area that includes a theater seat for two, dual slide out hide-a-bed sofas, and a front full wall entertainment center with 50 LED TV. This isa great space for entertaining, family gathering, or for added sleeping space too.Back down on the main level and through the kitchen you will find a side aisle bath on your right. This roadside bath offers a shower with seat, linen cabinet, toilet, and vanity with sink, plus overhead storage too.Lastly, a rear master bedroom with its own private entry/exit door to the outside. Here you will find a relaxing and comfortable queen or optional king size bed slide out with overhead storage, a rear wall double wardrobe with dresser, and a closet prepped for a washer/dryer if you choose to add the units. There is also a dresser/entertainment center slide along the curbside, plus so much more!